The experts are reporting that 61 percent of HR professionals are planning to leave their old software behind seeking integrated solutions in Human Capital Management technology that include talent management suites, a better end-user experience and improved analytics. What are your must-haves and deal breakers when it comes to finding the vendor of your dreams? Paycom wants to help you identify the best solution for your business and offers this infographic to take you through the vetting process as one might select a significant other. 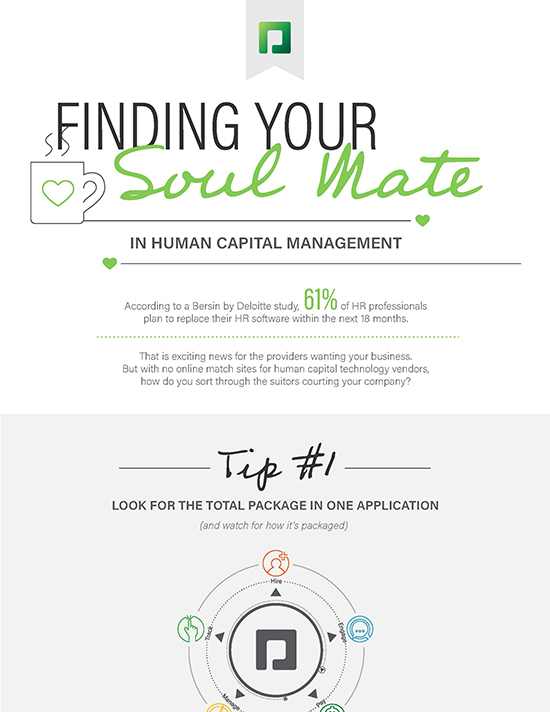 From what to look for in the total package to what to ask about the break-up process, Paycom hopes to empower you to find happiness ever-after in your next human capital management solution. See the infographic below to learn more.